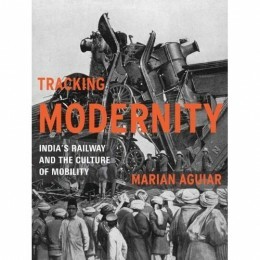 When I first heard Marian Aguiar discuss her book project on Indian Railways at an informal gathering of faculty and graduate students in the fall of 2005, I was excited, skeptical, and optimistic about her project all at once. As a child, Indian trains had always fascinated me. To my childish fancy, they always magically appeared on the horizon and carried unknown people to far-off places. Because of this, I’d always wanted to be a steam-engine train driver. I could visit distant places and without having to answer for it, return home smeared with grease, dirt, and (coal) dust. Besides, I’d heard exciting stories of my paternal grandfather who worked for the British Indian Railways as a stationmaster during the Inter-War years and retired during the heyday of postcolonial reconstruction. In fact, my happiest childhood memories are those of watching steam engines whistling at the sky. When Aguiar spoke of her interest, I anticipated an exciting read. However, I was skeptical of the efficacy of the project. After all, a study of what trains have signified to a previously colonized people could considerably rehash what has already been described in Indian history schoolbooks. The colonial administration touted the Railways in India as a harbinger of progress and as an emancipatory tool freeing Indians from archaic traditions, while masking the element of political control over a subcontinent and the inevitable exploitation of India’s natural resources. But when Aguiar added that she was also interested in exploring what trains mean to Indians today, my hopes were roused as well. As a Bengali, I’d heard horror stories, which had been passed down four generations, about the ethnic massacres in trains crisscrossing the Bengal-Pakistan border. Now, most discussions of postcolonial literature on the India-Pakistan Partition tend to focus on the sufferings of people situated in the Punjab-Pakistan border; the sufferings of those in the Bengal-East Pakistan region (now Bangladesh) rarely find mention. Moreover, most exegeses of Punjab-oriented Partition literature have not offered theoretically coherent understandings of the broader rhetorics of modernity at work. As Aguiar spoke warmly of the importance of the Railways at this traumatic historical moment, I hoped that her book would correct such a bias. Again, as a Bengali, I was familiar with internationally acclaimed film director Satyajit Ray’s depiction of trains. As a fan of Bollywood films, I’d noticed how mainstream Indian filmmakers used trains as a setting for developing characters’ ruminative moments, and even sometimes, to forward a raucous movement of action and plot. The western world has consistently misunderstood this genre by calling these films “musicals.” I hoped that Aguiar’s project might correct this bias too. Tracking Modernity: India’s Railway and the Culture of Modernity did not disappoint. The singular achievement of this book is that it not only revisits the canon of Partition narratives through rigorous attention to a greater diversity of texts including film, but it also offers fine distinctions between the ways recent postcolonial fictions of community are influenced by the continuing presence of railways in India. The third chapter analyzes how railways were germane to the formation of an imagined community in the immediate aftermath of the traumatic 1947 Partition into India and Pakistan; the fourth and fifth chapters, and particularly, the Conclusion bring out the far-reaching consequences of this unique association with Indian trains that are still being expressed in Indian literary texts, films, and Indian national politics. In 1947, people migrating from both sides (Hindus to India and Muslims to Pakistan) sought respite in the refugee trains; the latter were understood as a “civil arena” (75). The violence of the Partition sorely tested that belief. In chapter three, Aguiar combines theoretical insights from de Certeau and Etienne Balibar to make two remarkable points. First, the train offers the paradigm of a “space suspended from the intimacy of place”, thus effecting the transformation of social relations from concrete lived relations to abstract generalities. She shrewdly observes that this process closely “parallels [that of] national constituency” (84). The train becomes a sign of “abstract collective identity”, a process of “deterritorialization” implicit in modernity that allowed perpetrators of ethnic violence to target refugee trains (and their occupants) for murder, rapine, and loot. Second, the targeting of refugee trains reduced individual identities (of fleeing refugees) to mere communal ones, a process that, according to Aguiar (quoting Anthony Giddens), dis-embeds and displaces everyday social relations (85). Modernity disembeds established social norms through such actions. The “civil dreams of modernity”, as exemplified by the grand narratives of progress through voluntary movement, are broken; the counter-narratives of violence and terror now forge imagined communities. Close readings of Partition literature and film ground these two theoretical insights. This chapter offers the most sustained balance of theory and close reading in the book. The materials in chapters four and five explore the large-scale development of railway networks in the post-independence (post 1947) period and the ways in which it forged modern forms of national consciousness. Inspired by Raymond Williams’s work, Aguiar argues that the socially progressive era of railway extensions created an artificial “relational space” that allowed Indians to see themselves as part of a large network connecting developed and underdeveloped areas as a “kind of seam” (105-107). She astutely claims that, both epistemologically and ontologically, the trains’ creation of relational space allows the subject to form new connections, thereby forging a new kind of subjectivity born out of the “relations of movement” (107). Named by Aguiar a “traffic consciousness”, this subjectivity has an ambivalent relationship to the dominant “rhetorical, strategic, and imaginative” goal of achieving “economic homogeneity” in India (102, 108-115). Aguiar demonstrates this mostly through her detailed analysis of film director Satyajit Ray’s Apu trilogy. For example, she sees the train in the films as a harbinger of change and a producer of “the ambivalent consciousness and social relations of traffic” in the life of Ray’s protagonist Apu (109-110). In her analysis, she proves how the train while being a “persistent symbol of the new” also symbolizes those forces that fragment and destroy a holistic rural consciousness. Apu’s hopes and dreams are crushed by the seamlessness of the railway network. The network contains both a material and ideological structure. This structure lends itself, in a seemingly natural way, to incorporation by the post-independence rhetorics of modernization, modernity, and progress. In these chapters, Aguiar’s analyses also cover a wide range of texts from different stages of post-independence India to show how artists have questioned the monolithic vision of a modern India; her analysis shows how artists revisit its relevance to everyday realties. Aguiar’s work makes fine distinctions between the ways the male auteur and female writers pay attention to class and gender inequalities respectively. She also shows that all post-colonial narratives don’t use the “traffic consciousness” of their protagonists to question the dominant state ideology to the same degree. The position of the speaking subject depends on the relative degree of upward social mobility, a residue of the “rhetoric of colonial modernity”, which Aguiar analyzed in the Preface, as having placed modernity and mobility in a direct causal relationship (xvii). For instance, on account of the artists’ greater socially mobile status, diasporic fiction and film on India such as Kiran Desai’s novel The Inheritance of Loss and Aditya Chopra’s film Dilwale Dulhanya Le Jayenge are able to use the train to represent the nostalgia of an imagined and distant homeland, a position not necessarily available to more homegrown novelists and film directors (128-129). The fourth and fifth chapters of Aguiar’s book boldly claim that the broader alignments between subjectivity, mobility, and narration in postcolonial India make these narratives receptive to ideology-critique for three reasons. First, mobility becomes a metaphor that affords a forward movement of the stories. Second, the constructed spaces of the railway apparatus and the spaces in the train allow the possibility of this forward momentum through storytelling. Third, the train’s motion allows the subject to ruminate on the phenomenological possibilities made available to the memory and to the imagination (117-118). Unfortunately, Aguiar’s application of these claims to the developing scenario in postcolonial India rests on the implicit claim that the rhetorics of colonial modernity are still at work in new avatars. In her first chapter, Aguiar had argued that trains were understood as symbols of a “rational utopia”, a term she borrows from Michel de Certeau’s The Practice of Everyday Life. Briefly put, de Certeau had claimed that the impermeability of the train’s interior to the outside world it traverses gives the passenger a space of contemplative retreat from the complete chaos of life outside (de Certeau 111-114). Aguiar deconstructs the myth of such impermeability as colonial modernity’s attempt to preserve alterity and difference both through the phenomenological possibilities of hermetic isolation and a contemplative detachment through forward movement. However, despite the emergence of a “traffic consciousness” in postcolonial times, she applies the same phenomenological model to explain the problems of postcolonial identity and individual consciousness in later chapters. While discussing how, with the transformation of India through the Railways, women became a “kind of front line for maintaining certain patriarchal and class social orders”, Aguiar launches on a discussion of three films that range from the conservative representation of female train travelers in the 1960s to that found in diasporic films of the 1990s (Aguiar 137- 144). In Aditya Chopra’s 1995 hit film Dilwale Dulhanya Le Jayenge, the tenor of her argument suggests that, because of the ever-present distinctions between private and public space caused by the same binaries of inside and outside, the train “plays a stimulating…role [in narrating] the expression, sublimation, and finally, compromise of female desire” (144). The use of psychoanalytic terminology notwithstanding, the colonial contemplative attitude appears magically installed as a ten-armed goddess in such analyses. By preserving alterity and difference, this deity invests postcolonial protagonists and eponymous narrators alike with full powers to resuscitate a colonial attitude of contemplative retreat. Trains as products of colonial modernity’s rational utopia run their course through postcolonial junctions. In the concluding chapter of her book, Aguiar takes up the cultural production and meaning of terror; terrorism is both a material and cultural phenomenon as it adopts and adapts to the railway’s “enduring role as an emblem of modernity” (151). Recent terrorist attacks on Indian trains become counter-narratives to the rational emancipatory rhetoric of the postcolonial state. Postcolonial Indian “traffic consciousness” continues to pay its tithes to the colonial utopia through strum und drang. But Aguiar’s point is taken. After all, trains have endured in India as symbols of modernity. Greater mobility (read, voluntary movement) has implied greater access to socio-economic resources. In the lay sense, “to be modern” is to be upwardly mobile (1, emphasis in original). So, any oppositional discourse such as terrorism disrupts the bonhomie of public life by exposing the acceptance of everyday train travel in metropolitan centers (like Mumbai) as the product of a nation state’s ideological labor. A terrorist attack on Mumbai’s “Western Line” exposes everyday travel as forced, not voluntary, movement (167). While offering a longue durée vista of violence, murder, accidents, terrorism, and suicide on Indian trains, Aguiar brings the discussion of such counter-narratives into the broader cultural semiotics of modernism and modernity. I think one should read this book twice in order to assess its potential. It should first be read as a collection of brilliant chapters. For instance, the book’s second chapter can be read as a descriptive analysis of the nationalist discourse that exposed the colonial rhetoric of development through voluntary participation in train travel. This discourse critiqued such rhetoric by positioning the railways as a means of exploitation through the “compulsion of displacement” (xxi, 52, 60). Thus, at first, the reader could pay attention to the broad religious platform (no pun intended) from which a diverse number of social reformers and literary figures like Swami Vivekananda, “Rishi” Aurobindo, Mahatma Gandhi, and Rabindranath Tagore rejected the Enlightenment framework upon which the colonial justification of the railway projects rested. With a second reading, however, the reader will realize that the chapter’s strength lies in the way it narrates an important historical part of the relationship Indians and Westerners have had with modernity, a relationship that was, and continues to be, influenced by the “spatial and temporal paradigms of the [Indian] railway” (69). India’s trains have linked her cities, towns, and villages; they’ve helped redefine their presence less as points on a map and more as part of a modern Indian consciousness. As such, they are the material grounds of that unifying consciousness. Aguiar, Marian. Tracking Modernity: India’s Railway and the Culture of Mobility. Minneapolis: U of Minnesota P, 2011. Print. De Certeau, Michel. “Railway Navigation and Incarceration.” The Practice of Everyday Life. Trans. Steven Rendall. Berkeley: U of California P, 1988. 111-114. Print. Nilak Datta, Asst. Professor of English at the University of Indianapolis, has teaching and research interests in Postmodern American Literature, 19th century American Literature, Postcolonial Studies, Literary and Cultural Studies, Tourism Studies, Diasporic Fiction and Film, Critical Theory, Consumer Culture Studies, and World Literature. He has taught in India, Qatar, and the United States.